Parish Council Election – For info, the candidate selection process for Shotesham PC produced six candidates for the seven available councillor positions, so all six candidates have been elected uncontested. Further info on out PC is available under the Parish Council header above. Please keep an eye out for any unusual activity, remember that if you spot anything suspicious the police can be contacted by phoning 101. Ken Munro is the news editor. Please let him know about village news and events via Contact Us on the main menu or on 07880801674. How good (or bad!) is your broadband….help is here! Val and Lis from Upper Stoke are looking for a third person to share a private swimming slot at the Anchorage in Upper Stoke from May-Nov and possibly longer. Cost £70 for 26 sessions ie £2.70 a session. SHOTESHAM SCREEN. A full house turned out in April to see the acclaimed International Arthouse documentary Faces Places (Visages, Villages). Next up on 3rd May is the somewhat different but still highly recommended Leave No Trace, which tells the story of a father and his teenage daughter attempting to adjust back into society after living a life in the wilds of Portland, Oregon, click here for a full review. Venue as always, is Trinity Hall at 7.30pm, tickets £5 each and further details from Raz on 01508 550122 or razwoollacott@gmail.com. Next Room with a Brew! will be on Tuesday 21st May from 10.30 – 12pm at Trinity Hall, everyone is welcome to pop in for tea, coffee and a chat with fellow local residents. Tour de Shotesham – results to follow soon! Open Days at Shotesham Bowls Club. Once more we come to the beginning of a new season for bowls and are asking anyone of any age who might be interested in playing bowls to come along to the bowls green on Saturdays April 20th and 27th at 2pm for a 2.15 start to try the game. You never know you might like it and so enable the club to carry on for a few more years as without new members it could be in danger of closure. Please wear flat shoes and we can supply bowls if required. For further information call Alan Banham 550574 or John Torbitt 499541. Hope to see you there. Easter Monday, 22nd April, will see the annual Shotesham Easter kids event. Crafts, Easter Egg hunt and egg races, finishing with a reading from Dawn. Any donations of cakes and biscuits would be much appreciated. The event takes place at All Saints Church from 2.30pm until 4.30pm, kids of all ages are welcome. Following a phenomenally successful return last year, the Shotesham Duck Race (aka the Kenducky Derby) returns to the Common on Sunday 5th May. With our normal sunshine service returning, we’re set for another quacking event so get your ducks early, which can be booked via Ken – resotan@aol.com or Simon – simonnisbet27@gmail.com or at The Globe. There is a Garden Group visit to Barcham Tree Nursery, Eye Hill Drove, Ely, on Wednesday 24th April at 2pm. Barcham’s is the largest nursery selling mature trees in Europe. It has over 300 species and 125,000 trees growing at the nursery. The tour will take about 2 hours, sturdy foot wear is recommended! They do not charge for the tour but like to collect a small donation for a local charity. This fascinating trip is open to everyone, if you would like to go please contact Jenny Clarke on jennyclarke@uwclub.net or 550261 to organise car sharing etc. Shotesham Gardeners Annual Bring and Buy Plant Fair is on Saturday May 18th 10-12 at the Trinity Hall, where both professional growers and local people will sell their plants. Again, there will be a wide, and varied, selection of plants and seedlings for sale. This year Sarah Cushion and also Walnut Tree Garden Nursery will have stalls. If you have plants you would like to sell, bring them along, labelled, to the Trinity at 9.30 on the Saturday ortake them to Sue Astbury’s Rectory Farmhouse, The Street earlier in the week. 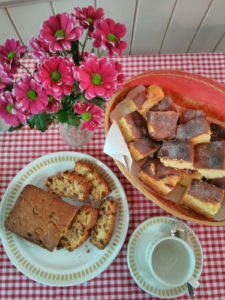 25% of all sales will be donated to the Shotesham Gardeners funds. For more information phone Sue on 550377. 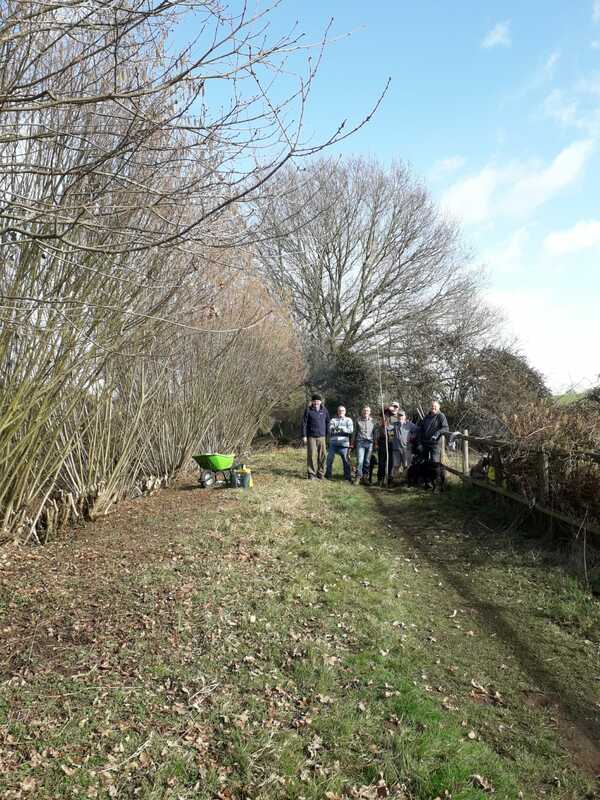 Conservation Group….good work by a motley crew in (known locally as) Wash Lane, click on photo for more. Keep an eye out for upcoming dates, all support always welcome. The outcome of the Shotesham Conservation Area consultation has been announced with the revised boundary being adopted. Main areas affected are to the south end of the village on Brooke Road and to the north end along The Common, in addition to a couple of smaller areas in between. If you / your property has been directly affected you should have been contacted directly by South Norfolk Council, in the meantime the revised boundary and other info can still be found at this link. Walking Group. 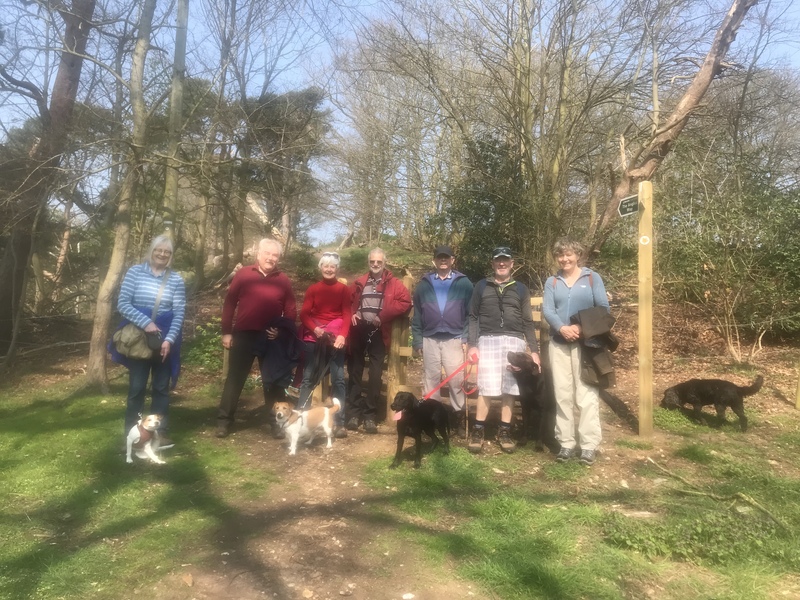 A lovely walk in the beautiful spring sunshine on the Angles Way by Bungay, and we managed not to lose any dogs! Must be a first! Next walk is on Sunday April 28th, 10.15 at the Trinity. Let’s hope the sun continues to shine. 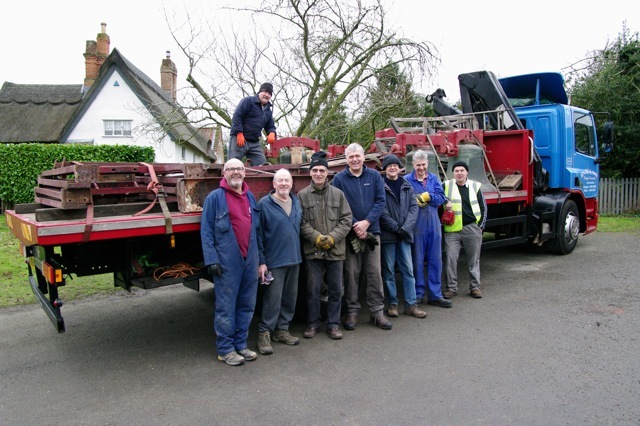 On Wednesday 16th Jan we said goodbye to the bells and their framework when, in line with the schedule, they left for the foundry in Loughborough for refurbishment. Click on photo to see more. Preparations for re-installation will commence on 8th April, with the bells themselves now due to be hung after Easter. Norfolk County Council update on the North Western Linkroad here, results of last year’s Children’s Services consultation here. 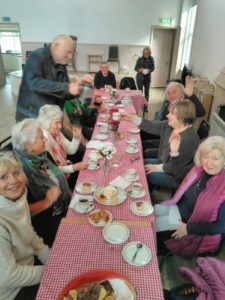 South Norfolk older people’s forum, details here. Thinking Fuel – If you feel you may be paying too much for your oil, Community Action Norfolk (CAN) have a scheme that may assist. Click here to see how you might save and here to see how it works, or go directly to the CAN website for more details. The next public meeting run by Norfolk Constabulary takes place on Wednesday 27th March, 7-9pm at North Wymondham Community Centre. Click here for poster info.